ICC GOC Brigadier General CL Smith and Staff looking over the Gaza position after its capture. In 1976 George F and Edmee M Langley produced a unit history about the Imperial Camel Corps called: Sand, Sweat and Camels - The Story of the Australian Camel Corps, in which included a section specifically related to the battle of Beersheba and extracted below. General Allenby realised the cost of a frontal attack on Gaza and the advantages of a flank attack. His aim was to occupy Beersheba on the left of the Turkish line, which would leave their flank exposed. He would then disorganise the Turk's whole plan of defence by hurling in his 20th Corps of infantry, four divisions strong, together with his Desert Mounted Corps and Camel Brigade. The 21st Corps was to move against the Gaza end of the line. The country to be covered was a bare rolling plain, without a single plantation, fence or hedgerow to shelter movements from a watchful apprehensive enemy and his German airmen. Our railway line from Kantara was only eleven miles from Gaza and growing daily. The pipelines from the 'sweetwater' Canal had reached Rafa, providing a daily supply of hundreds of thousands of gallons of filtered, chlorinated water. 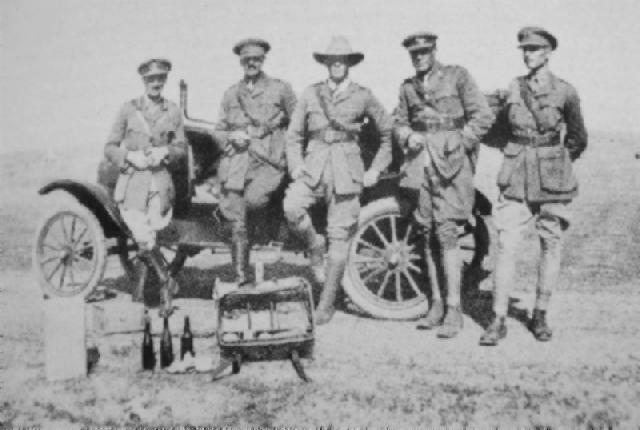 Allenby's army (including Egyptian labourers) was close upon two hundred thousand men, in addition to some twenty thousand camels, forty-six thousand horses, fifteen thousand mules and a few thousand donkeys, all dependent on foodstuffs and water from outside sources. These railway and pipelines were being continued towards Beersheba. At Shellal a dam was constructed to hold five hundred thousand gallons-here arrangements were made to fill and load onto camels every hour two thousand fantassies, each containing ten or twelve gallons of water. The Turks on the other hand presented a contrast highly favourable to the invading force. The Turkish army at this stage was ill-fed, wretchedly clothed, uncertain of its supply of munitions, and very low in spirit. Von Falkenhayn, the German leader of the Baghdad expedition was at dangerous variance with 'the mighty Djemal' as he contemptuously called the Turkish Governor of Syria. The `Young Turk' administration at Constantinople, with the Germans in full support had resolved to recapture Baghdad, which had been so brilliantly won by General Maude. On the other hand Djemal realised that Palestine must be cleared of the British before Baghdad could be taken. He also bitterly resented any interference or advice from the Germans, though, he had to appreciate the arms, and planes and technical services they gave him, which alone made his campaign possible. Neither Djemal nor  the German leaders believed it would be possible for Allenby to make his attack on the Beersheba flank, but fully expected the first blow to be made on Gaza, combined with a landing from the sea, north of that town. They were encouraged in this belief by the sham preparations made for a landing on the coast. When the Turks did decide to divert substantial forces from the Mesopotamia Expedition and send them to anticipate and frustrate Allenby’s assault, it was too late. The Camel Corps dug in after dark on the hillsides, but during the night moved forward a mile and again would dig in . Under cover of darkness the Light Horse, Camel Corps, Artillery and London and Welsh Infantry congregated at the rendezvous within striking distance of Beersheba. The Londoners, at dawn, dashed forward and seized the Turks’ advanced position. Throughout the day, the Camel Corps Brigade took no active part in the battle and soon after dark it seemed probable that they would be wanted to clear the defences between the Gaza and Karm roads. However, the success of the main attack was soon evident and the works were evacuated.